Yoshimura mufflers, as always, are born in racing. The new square R-11Sq muffler which replaced the triangular R-11 in the 2015 season are hitting the street for the company’s 2016 lineup. The R-11Sq inherits the core design and quality of R-11 and is initially available for literbikes including GSX-S1000/F, GSX-R1000, YZF-R1/R1M and Ninja H2. Superbike racing –––– such as Suzuka 8 Hours, JSB1000, WorldSBK and AMA superbike –––– is the top competition series between production-based motorcycles and runs under strict noise regulations. Japan Superbike 1000 for example limits the exhaust noise level to 105dB at 5500rpm which is relatively quiet for a race bike (especially when compared with MotoGP’s 130dB at 5500rpm for a four-cylinder bike). The requirements were high. Engine performance, lean angles, weight, size, rigidity and other numerous aspects had to be taken into account in the design process. Yoshimura engineers finally came up with a unique and innovative solution –––– a square silencer. For 2015, Yoshimura Suzuki Racing Team replaced the R-11 muffler with the newborn R-11Sq, but as they expected, “no one including rival teams and press noticed the difference except for Suzuki satellite teams.” The resemblance was deliberate as they share the same design concept. The task was to increase the muffler capacity in order to handle the exhaust noise while retaining the core design, but simply enlarging the size of the R-11 will ruin the overall visual appearance. What they pursued was a subtle but distinct difference. Structural rigidity of the muffler itself in turn becomes an issue since you are trying to turn a triangle into a square. “It took a lot of tweaking to optimize all the curvatures, corner radiuses, bending coordinates, welding points and so on from scratch,” he recalls. Following the success in competitions, the R-11Sq went through the transition from the racetrack to the street. The R-11 on the other hand also has great style and performance, and it perfectly emphasizes the excitement and agility of supersports bikes, but some say it looks a little too small for 1300-1400cc mega-sports bikes. Not too big, not too small. Having the larger capacity makes the exhaust sound more sonorous and sweeter. It has a good silencing effect and it suits perfectly on big bikes. If you appreciate the modest attitude and sportiness in its appearance, this would be a great upgrade. Although the size difference between R-11Sq (above) and R-11 (below) is obvious in comparison, each muffler looks the right size when fitted on a bike. The new R-11Sq series are initially available as slip-ons for GSX-R1000, GSX-S1000/F, YZF-R1/R1M and Ninja H2. More releases are expected in the future, so big-bike riders should stay tuned. The R-11Sq will no doubt become another flagship muffler of Yoshimura Japan. The R-11Sq is best viewed from behind. Its cross-section is a trapezoid with the long side facing the rear wheel. Each and every delicate dimension of the cross-section, the metal sleeve and the carbon end-cap work in harmony to express the sportiness. It provides plenty of lean angles as proven on racetracks. The street version is designed upon the racing experiences and it closely follows the dimensions of the race version. The stylish end-cap is made of carbon. The silencer sleeve is available in five different finishes: Stainless Steel, Satin Finish, Metal Magic (etched & black painted stainless steel), Titanium and Titanium Blue. There are four variations to meet local regulations: Street Sports, EEC Approved, JMCA and TIS. The most salient difference between the two mufflers is their exclusive badges. Shown here is a sporty, arrow-like R-11Sq badge on Metal Magic silencer. Rivet band is also newly designed. It is made to be sturdy and is visually lighter and more elegant. The badge and rivet band for the R-11 have been renewed in 2016. 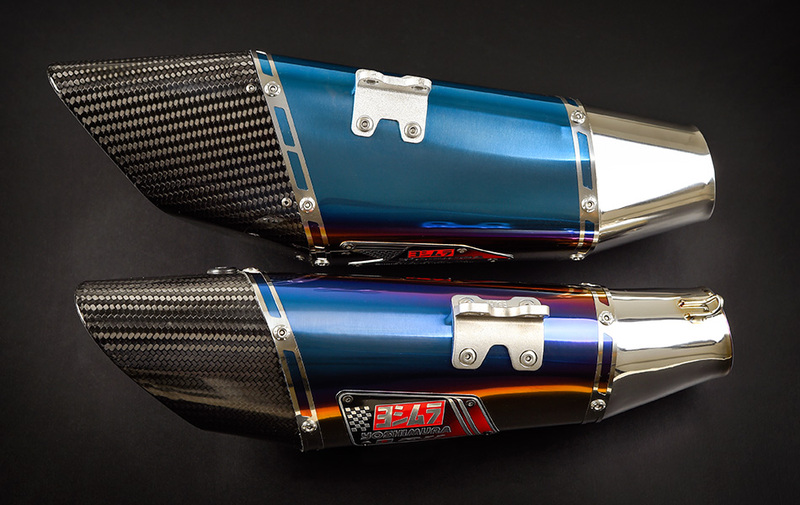 Each Yoshimura muffler features a laser-etched serial number and QR code. The muffler springs are as original as the rivet band, adorning Yoshimura logos on the rubber vibration absorbers. These are some of the many features that make you a proud user of Yoshimura muffler. The base machine for Yoshimura Racing team surely looks great with R-11Sq. It gives the bike a racy but moderate presence, and since it’s a Yoshimura muffler, it features an incredible flow. Both R-11 and R-11Sq are available for the bike, so you can decide which style and sound you like. Either muffler will definitely make the GSX-S series more aggressive looking. As its square form matches amazingly on the YZF’s, the R-11Sq emphasizes the distinctive sound of the crossplane crank engine. Way more compact and lighter than the stock muffler and still has an unignorable appearance that accentuate the aggressive styling of the Ninja H2. The well-respected Japanese racing constructor / aftermarket parts manufacturer & supplier, started its business in 1954. The company has been racing and tuning Suzuki motorcycles since the late 1970′s following the years of dedication to Honda and Kawasaki. Their product development, however, is targeting diverse applications ranging from 4-stroke minis to supersports of various brands.